No wonder I got a busy signal! That's a good one! I had a hard time deciding between songs, so I went with the old standby! Haha! I can't say, but I'm expecting a pepperoni pizza in thirty minutes or less! Love the photo and the old phone! Cute! Hey Emma! I was going to call you, but I had a hard time getting my paws to fit in the holes! Hahaha! It is actually from the 1930's and it weighs a ton! My husband put a modular connection on it so it does plug in and really works! The ringer on it is extremely loud though. I'm pretty sure that our neighbors would be able to hear it. Haha! Thanks for stopping by today. Have a great Wordless Wednesday! You calling one of your girlfriends Bentley? That's a pretty cool phone you have there! Thanks! I love old things and have been able to find some pretty cool stuff through the years. Sadly, some of the things that I bought when I was younger are now considered vintage!! Hahaha! It's not often you see a rotary dial! That is back from when you had to actually remember people's numbers! Hello, thanks for stopping by for a visit! So cute! 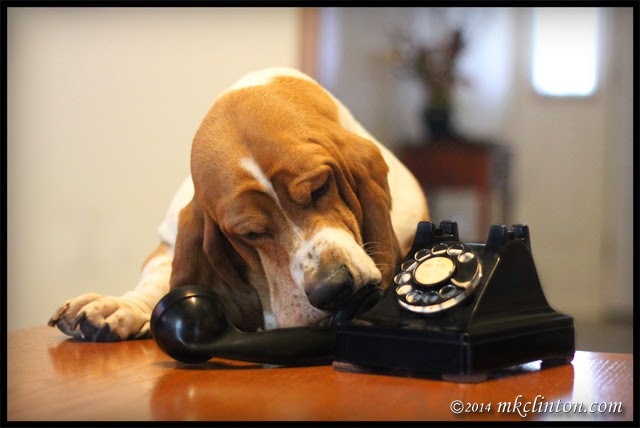 We have been trying to use the phone at MyDogLikes....not having thumbs makes it a challenge! It really does! They didn't design them for paws back then! Did you learn how to call 911? I'm trying, but that 9 is pretty tricky to get all the way around! Maybe time to update to a new phone? What!?! They make newer ones?? LOVE the photo! Hrm, was it BENTLEY Faraday was talking to? Haaaa!!! What did you SAY to him, Bentley? Allie hopes it was "straighten up and fly right"!! Faraday told me not to let the cat out of the bag as to our discussion! Wondering where you found that phone? I haven't seen one of those in years. I got it when I worked at the phone company many years ago. It still works! We can hear you loud and clear! Good deal, I'm talking as loud as I can into this funny looking thing! I can't hear you Bentley! Little louder please, for those of us here in Canada! BOL! This is adorable. Every time I see one of your posts I'm reminded that I need to do a Throwback Thursday tribute to our family Basset, Pansy. Yes, the link will be open until late Saturday! Bentley is so cute! Love the picture! Is he ordering treats over the phone? Oh Bentley you are too cute!! Oh Bentley you are just too cute for words! I love this photo :) I hear you loud and clear. He is sure giving that phone a once over! Its almost as if he is a detective or a police officer....oh that right! He plays one in The Returns! This reminds me of a dog I once had who would go crazy when the phone rang. I was working and would call her several times a day to get her to exercise. I became known as the crazy lady who phoned her dog. Oh Bentley... I would love to be able to hear you, you look so cute in this pic! lmao, yes yes I can hear you! I can hear you loud and clear, Bentley. I love the Retro phone but my kids probably wouldn't even be able to use it! Where's the number and send buttons? Haha ... to funny!